Sunday March 30th 1924 I felt much better. I should have had a doctor before, wrote to Ida in forenoon. I went to Miss Tomlinsons for dinner. I wrote Hattie after I came home. I sent telegram to Ed Reed. I read in evening while Mattie went to church. 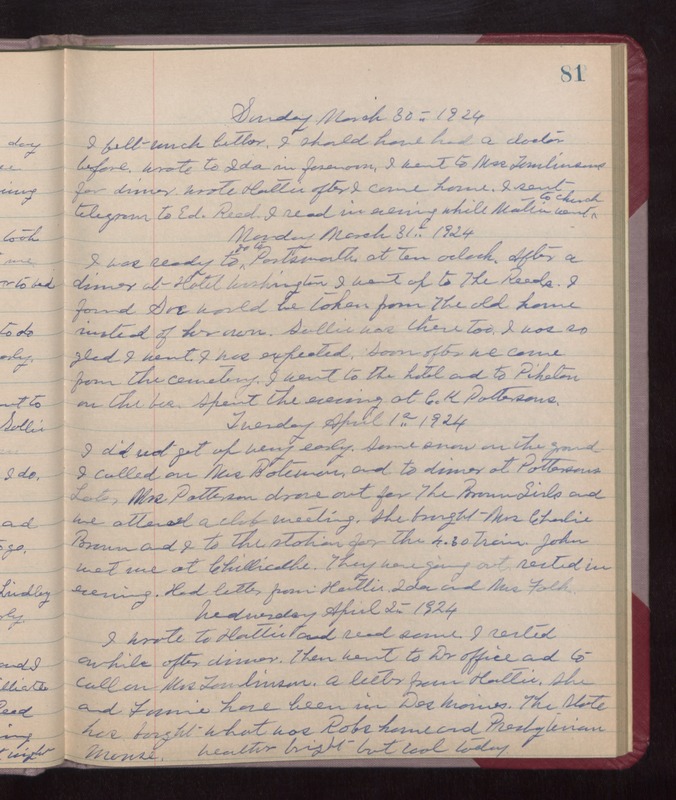 Monday March 31sy 1924 I was ready to go to Portsmouth at ten oclock. After a dinner at Hotel Washington I went up to The Reeds. I found Sue would be taken from The old home instead of her own. Sallie was there too. I was so glad I went. I was expected. Soon after we came from the cemetery. I went to the hotel and to Piketon on the bus. Spent the evening at C K Pattersons. Tuesday April 1st 1924 I did not get up very early. Some snow on the ground. I called on Mrs Bateman and to dinner at Pattersons. Later Mrs Patterson drove out for the Brown Girls and we attended a club meeting. She brought Mrs Charlie Brown and I to the station for the 4.30 train. John met me at Chillicothe. They were going out. Rested in evening. Had letter from Hattie. Ida and Mrs Falk. Wednesday April 2nd 1924 I wrote to Hattie and read some. I rested awhile after dinner. Then went to Dr office and to call on Mrs Tomlinson. A letter from Hattie. She and Fannie have been in Des Moines. The State has bought what was Robs house and Presbyterian manse. weather bright but cool today.